Notes The first track of the game. Ancient Lake is the first track in Diddy Kong Racing and its DS counterpart, Diddy Kong Racing DS. One balloon is required to get in this track, while six are needed for the second challenge. This track has been made for beginning racers and is fairly easy due to low level computer A.I. The track is mainly in a circle, around a prehistoric lake. There are two zippers in this track as well that can make the racer move faster for a few seconds. A dinosaur is also near the end of the race, getting in the player's way. This track also holds the key to the locked door in Dino Domain. It is in an overlooked area on a ramp that requires a speed boost to get to. The track begins with a straight road. There is a small bump with a few Bananas. After the bump, there are two Red Balloons on the left and two Blue Balloons on the right. There is a gentle turn to the left. After this, players can use a Zipper. 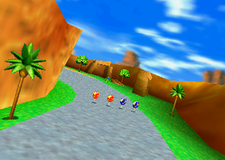 They can take the main path containing a few Bananas or they can travel on the grass to collect a Blue Balloon. Soon, there is a overhang. Two Red Balloons surround a Blue Balloon. There is a turn to the left with the edges being water. A large green dinosaur also roams in this area, serving as an obstacle. After this turn, players can use a Zipper to speed to the race line. In the Nintendo DS remake of the game, the last segment is covered by a large tunnel, being followed by a small bridge over a small river. In the original Diddy Kong Racing, Ancient Lake is filled with eight coins, scattered all around the area. However, the coins only appear once the player has beaten the world's boss at least once. On a small bump before the first set of Item Balloons. Shortly after the first set of Item Balloons in the center of the track. Just after the first set of bananas, found in the center of the track, just like the other coins. Slightly in front of the third coin. When the racer rides around the first turn, the coin is in the center of the road. Not too long after the second set of Item Balloons. In the dinosaur's path, shortly after the sixth coin. As usual, it is located in the middle of the road. After hitting the last zipper, the coin can be found between two bananas. This page was last edited on April 24, 2019, at 00:46.